The enthusiasm I feel about skincare knows no bounds. My bedside table (back at home in the UK, sob) is full of lotions and potions, my lip balm collection is out of control and my boyfriend frequently gets roped into Netflix and sheet mask evenings. Once, a lady in a coffee shop stopped and asked me what skincare I use - seriously, it made my whole month - and it took about 0.2 seconds for me to whip out a napkin and start scribbling down a ton of recommendations. When packing for the nine-month trip that I'm currently on with said reluctant sheet-mask wearing boyfriend, deciding which skincare products to pack was a task that I borderline agonised over - so whether you're heading off on holiday soon too and need recs like coffee-shop-lady (or just fancy a nosey in my toiletries bag!) then you're in the right place. One product that needed no deliberation was Glossier Milky Jelly Cleanser. I've actually written an ode to it here - and find it the best all-round face wash for baby-soft, perfectly clean skin that feels happy and bouncy without any dryness. They make a handy diddy cabin-sized version (or you could decant into your own container) if you're going on a shorter trip. I'm actually nearly out, but I'm sure I'll manage without it. 90% sure. Maybe 60%. Forgoing toner, oil and serum (who am I?) I skipped straight to the moisture section of my routine with the hope that sea and sun would be my new acid toner. My all-time favourite Elemis Pro-Collagen Eye Renewal had to come on the journey as it has the most instantly replenishing gel formula and noticeably firms the area. I also packed the matching Elemis Pro-Collagen Hydra-Gel Eye Masks in my carry-on and couldn't recommend them for flights (or life in general) more - think immediate, soothing relief. Bliss! My face moisturisers of choice are the Caudalie Vinosource Moisturising Sorbet - full review here - for when I'm more on the dry side and need something more intensive, as this stuff banishes all feeling and signs of dehydration in a flash. 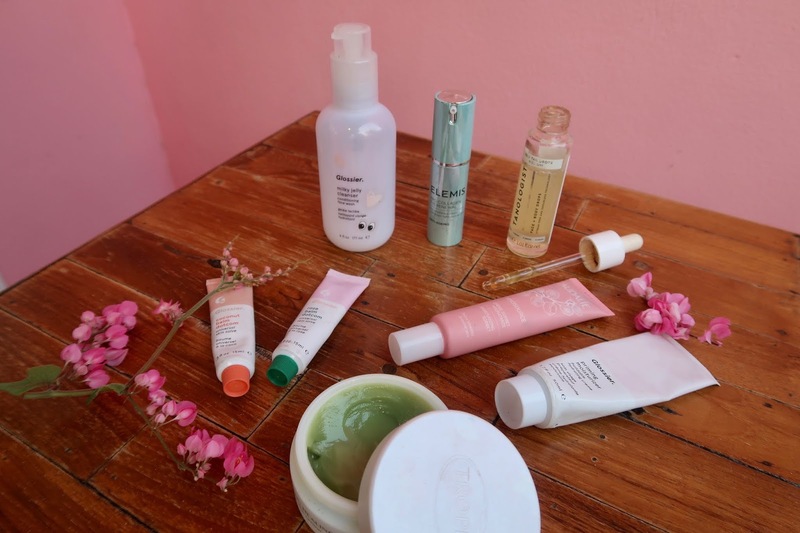 The Glossier Priming Moisturiser is a fantastic everyday go-to staple - a little goes a long way and you can build it up, which I like to do in the evenings as I can kind of trick myself into thinking that I'm using a night cream. Can anyone tell that I'm missing my full skincare stash? Not as travel-friendly as the other products (big factor during the packing process!) but something I really wanted are the Tanologist Face & Body Self Tan Drops in 'Medium'. This serum gives you a made-to-measure tan depending on how many drops you add to your moisturiser, and as someone who doesn't enjoy sunbathing and whose face never seems to tan anyway, that's very appealing! This way, my face matches my body and all is well. Sun protection is a biggie so I brought the La Roche-Posay Anthelios XL 50+ Ultra-Light Fluid for its gorgeously silky texture, and the Bioderma Photoderm Max 50+ Tinted Aquafluid for a water-resistant anti-shine finish with a hint of coverage. Body-wise I'm a huge fan of the Garnier Ambre Solaire UV Water - it feels so hydrating and leaves zero greasiness or white marks on your cute leopard-print bikini! I also love the Coola Eco-Lux Sunscreen Spray for the way the nozzle produces a truly fine mist (hard to find and much appreciated!) and the fact that it smells like the most delicious piña colada ever. Last but not least we have balms. I absolutely live to apply a good balm, hence why I have four and why 'minimalist packer' will never be on my CV! Three of my little balmy quartet are made up by Glossier Balm Dot Coms: Rose (reminds me of home, good for when the soul needs soothing), Coconut (literally smells like holidays, needs no explanation) and Mint (by far the most moisturising of the bunch, with a nice little added tingle). I mainly use these on my lips, but also massage them into my cuticles and elbows if they need some TLC. 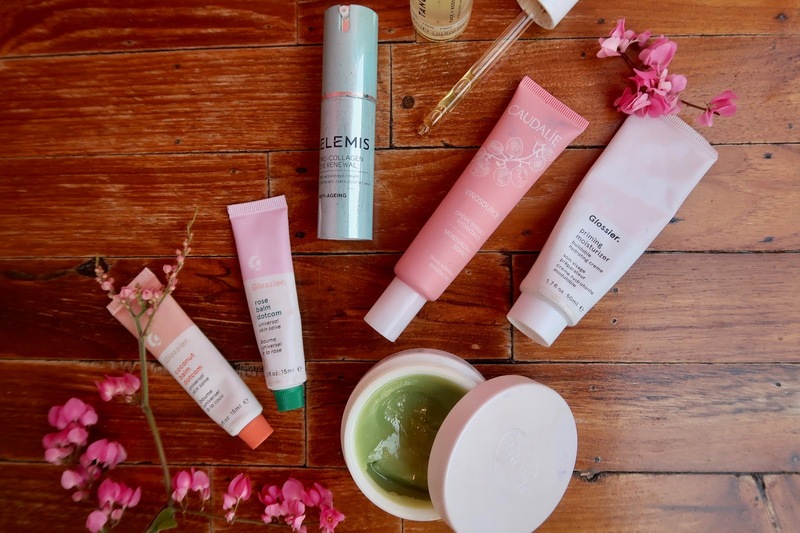 The final fourth slice of the balm pie - I'm going too far with this - is the Tropic Tamanu Healing Balm, an "all-in-one skin saviour" and my personal skincare hero. It contains tamanu oil which is a Polynesian remedy that "promotes the formation of new tissue and accelerates skin healing", and has genuinely helped me so much during our trip already. Whether I've got scraped knees from tripping over on uneven roads or can play dot-to-dot with all the mosquito bites on my legs, I've been reaching for this balm and find that it always relives and improves the look of every scar or scrape in record time. Aside from the actual basics (deodorant, soap etc!) that's everything I'll be applying to my skin for the next few months. Eight weeks in and we've already had to make a pharmacy dash a couple of times for more SPF and as mentioned my Milky Jelly Cleanser is on its last legs, so please let me know if you have any recommendations for the best places to buy skincare in Asia. I hope this helps with all of your skincare-packing needs!